Beaujolais. Just say it. Bo-zho-lay. Do you feel French? You should. It just feels good to say the name of one of the most famous wines in the world. And next Thursday, on Nov. 15, the release of the 2108 vintage of Beaujolais Nouveau will take place once again. Young and fresh, two things that are admirable and enviable qualities in life, are the hallmarks of Beaujolais Nouveau. Each year on the third Thursday of November, at exactly 12:01 a.m., the Beaujolais Nouveau wines are released with great fanfare to the public. These wines, which were harvested just a few weeks earlier, are among the most youthful consumed on the planet. Fruity and fresh, they are the first representatives of the 2018 vintage, one that is expected to be an excellent one for much of France. But in the wine world the buzz from Beaujolais is not about Nouveau, but about the cru wines from the region. Walk into a trendy wine bar, restaurant or noted wine shop and say the word “Beaujolais” and you are more likely to be rewarded with a glass of gamay from one of the dozen cru designated villages in northern Beaujolais, than the more highly marketed Nouveau. It is one of the notable upgrades in wine in recent years. The infant wines sold under the Beaujolais Nouveau moniker often can be a bit thin and a touch sweet and, while charming in their own way, are not really ready for prime time, if you know what I mean. In fact the genesis for the lauded release date was a plan to sell what was once called vin ordinare, with dispatch. Consider that the release date is just before the American Thanksgiving, or turkey day, which is perfect for light and fruity wines. It was brilliant marketing by the region (with special kudos to one Georges Duboeuf) and the tradition remains delightful. Beaujolais is a beautiful wine region located in central France, just south of the considerably more loved and esteemed Burgundy. Running nearly 35 miles in length from Macon, the southern end of Burgundy, to just north of Lyon, Beaujolais is one of the few places in the world where the gamay grape is grown. Gamay is a purple, highly acidic, thick-skinned grape that, unfortunately, has paled when compared to the infinitely more popular pinot noir grape that dominates the neighborhoods to the north. But it has its advantages. It is prodigious and it ripens early. And it is delicious in its own right. Each year, the gamay grapes are harvested by hand (French law states that Beaujolais Nouveau must be hand-picked) in early September when as many as 50,000 pickers descend on the region to help with the harvest. The grapes are fermented using a process called “carbonic maceration” where whole grapes are placed in a large vat and carbon dioxide is pumped into the containers. The juice actually ferments inside the skin of the grapes, as opposed to more standard winemaking techniques where juice is first crushed out of the skins and then ferments on the skins gathering color and flavor. The result is the light, fruity wine that gets little, if any, tannins or embellishment from the skins of the grapes. The wine is quickly bottled and then rushed to market for the anticipated November release date. But the cru wines are bit more, well, serious. There are 10 villages — crus — that run from south to north in the northern reaches of Beaujolais. These crus also use the gamay grape for their production but tend to both make the wines in a manner that is more consistent with the techniques the pinot makers of Burgundy utilize (no carbonic maceration), and also to allow them to age a couple of years longer. The result is that the wines show much more of the original character of the previously un- appreciated gamay grape. The dozen crus are Brouilly, Chénas, Chiroubles, Côte de Brouilly, Fleurie, Juliénas, Morgon, Moulin-à-Vent, Régnié and St.-Amour. 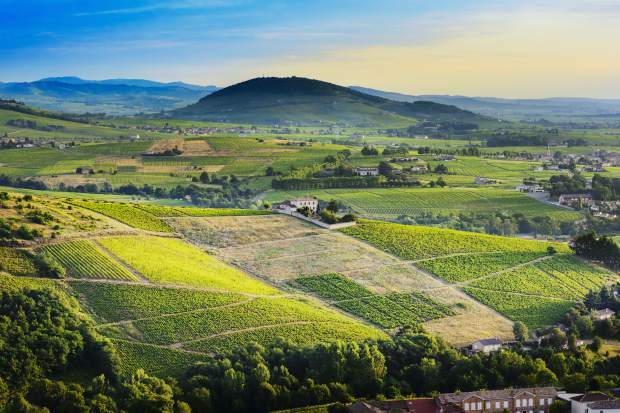 Each has its own distinctive flavor composition based on the soils and the location, but it is the focus and attention of the individual makers that really has brought these cru Beaujolais wines to the fore. And while the cru wines are a bit more expensive than Beaujolais Nouveau, they are a steal when compared with fine wines from Burgundy. So look for the labels of the cru Beaujolais wines (they feature the names of the crus above) and you can upgrade your Thanksgiving options.